There are some traditions which remain timeless especially those that adhere to the basic laws of nature. One such medical tradition that provides an "antidote" to literally all ailments that result from today's stressful lifestyle is "Ayurveda". This traditional science has been handed over through the centuries by ancient physicians, who greatly valued health and fitness of the human body. This science true to its name is well accepted as a natural and effective way of keeping the body healthy and free of toxins. Ayurveda literally means the “Science of Life” -- “Ayur” meaning life and “Veda” meaning science. Today Ayurveda competes with the most advanced medicinal sciences and has effective remedies for various ailments and also offers solutions to stress and strain, which is accumulated in our day to day living. The principles of Ayurveda state that nothing exists in isolation, so that everything you interact with - your diet, family, work or relationships - has an effect on your health and well being. One guiding principle of Ayurveda is that mind and body are connected and that the mind has a profound influence over our health and well-being. While conventional western medicine is still grounded in the paradigm of mind-body separation, Ayurveda holds that health is more than the absence of disease; it is a dynamic state of balance and integration of body, mind and spirit. One basic, common idea of medicine and philosophy is that whatever one finds in the universe or cosmos is found also in the human body. That is why it is necessary for Ayurveda physicians to study the physical constitution of the universe in order to understand the body properly. Ayurveda teaches us how to maintain health and promote longevity. Every human being is a unique combination of the five elements provided to us by Mother Nature, these elements being earth, water, fire, air and space. In Ayurveda there are three primary life forces in the body or three Doshas. These are called ‘Vata’, ‘Pitta’ and ‘Kapha’. A perfect balance of Vata (space and air), Pitta (fire) and Kapha (water and earth) results in healthy state of human body, which constitutes of mind, body and soul. 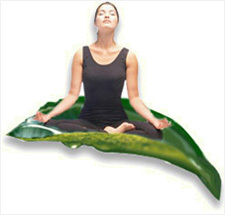 Ayurveda maintains that ailments are a result in the misbalance in these vital forces of life. The primary objective of Ayurvedic therapies is to diagnose and establish the misbalance which could be the elevation or depression in these forces and then prescribe and offer treatments to bring the forces back to normal and balanced levels. Health is a means, not an end. It should be maintained to achieve full living and true salvation, which is dharma (righteousness) artha (wealth) karma (pleasure) and moksha (Liberation). Formed from space and air, is responsible for bodily movements and the nervous impulse. Formed from fire and water, is responsible for the metabolism and the enzymes; Formed from water and earth, governs the body's organs and is responsible for physical structure and stability. Our partners pioneer in running health resorts, spas and centers all over the world. They have many decades of experience in production and practice in the traditional science of Ayurveda. They have won many awards and certifications and are considered as one of the best in the world. Various types of Ayurveda treatments and medicinal massages are offered at our partner’s Ayurveda center. Highly motivated and committed team of doctors and practitioners ensure the highest levels in the quality of treatment and medicinal preparations. The special health and beauty care packages are specifically designed to treat modern day maladies like stress, respiratory problems, eye ailments and skin diseases. AyurvedaGram steals you away into a whole new world of ethnic charm. Taking you back by over hundreds of years, this ethnic Ayurveda Health Resort has been transplanted from Kerala into 7 acres of herbal garden at Bangalore, India's Garden City. Backed by one of India's leading Ayurveda Institution, Kerala Ayurveda Pharmacy Ltd. (KAPL), AyurvedaGram Ayurveda Health resort is an Ayurveda village with resident physicians, therapists, health Centre, dispensary, yoga and meditation centre, heritage cottages and an ever-attentive service staff. AyurvedaGram Heritage Wellness Centre is rated amongst the Top Five Spas or Ayurvedic Health resorts (Ayurvedic resorts) in the country and provides authentic Ayurvedic Treatments for specific aliments such as Arthritis, Obesity, Spondylitis, Cholesterol, Sinusitis, Peptic Ulcer etc using common ayurvedic therapies such as Panchakarma, Rejuvenation, Stress Management and several other Kerala therapies. Whether you are looking for Ayurvedic treatment or a weekend get-away in an Ayurvedic Health Spa, AyurvedaGram has a whole range of programs to suit every individuals need. AyurvedaGram is an effort to provide authentic ayurvedic experience in the splendid settings of the land, where it has been practiced for centuries. These have been aesthetically furnished to suit the needs of our valuable clients who came for better Health and Hospitality Naturally! Ayurvedic treatments and medicinal massages are offered at our partner’s Ayurvedic Center. The special health and beauty care packages are specifically designed to treat modern day maladies like stress, respiratory problems, eye ailments and skin diseases. A multi cuisine restaurant serves healthy wholesome food. A qualified dietician helps guests to choose the right kind of food taking into account their ailments or dietary requirements. All items are made from organic vegetables grown in their own garden. This leads to a whole new dimension in the enhancement of health and the joy of eating. The Ayurvedic centre has its very own herbal garden where rare herbs of great medicinal value are grown. These are used in ayurvedic preparations and treatments. The Ayurvedic centre has a yoga and meditation center with committed and expert instructors to instruct guests. Special care is taken to help guests master these ancient forms. Yoga and meditation have great relevance in our age where changing lifestyles have brought about early onset of stress related ailments. A badminton court and indoor recreation room are among the facilities that offer guests a chance to relax and interact. Other facilities include jogging track, billiards room, tri cycling, tennis court, health club, sightseeing and cards room. A business center fully equipped with a cyber cafe, photostat machines, and fax machines help guests to keep in touch with their business. Special dance and martial art performances are held in a beautiful amphitheatre. The ethnic architecture of the theatre adds to the overall atmosphere of the performances. In the table below is a sample schedule that guests in the resort follow. AyurVaid Hospitals is a new generation hospital chain pioneering rigorous, process and documentation driven, classical Kerala Ayurveda medical services that is appropriately and effectively integrated with modern medicine. It seeks to make accessible nationwide quality Kerala-Ayurveda medical care, particularly for chronic illnesses. AyurVaid administers medicines which are customized and are well under permissible limits. It currently has two hospitals in Aluva and Cochin in addition to the just opened unit in Bangalore, which are functional. You can consult with a senior Ayurveda physician; either the Short Consultation (20 to 30 minutes) for minor, routine illness or medical condition, or the Brief Consultation (about 60 minutes) for a specific problem that is relatively serious, or chronic. Where there are multiple afflictions, and a complex medical history, a Detailed Consultation (about 2 hours) is recommended leading to a complete personalized health plan. Referrals to the integrated specialty consultation sessions or external specialists may happen depending on the nature of presenting complaints and risk factors uncovered. You can stay at a hotel and visit the AyurVAID Hospital to avail of quality care. Ayurveda diet can be adhered to through a standalone meals service made available to our out-patients. We have defined the criteria and medical conditions where outpatient/inpatient treatment is appropriate and acceptable. The rooms at the AyurVAID Hospital are simple, well-ventilated, spacious, and hygienic. Depending on the patient and/or the medical condition (nature and extent) inpatient treatment might be mandatory. The treatment duration might be of 7/14/21 days or higher depending on the nature of your medical problem. A full range of support services are in place to make your stay as personalized and comfortable as possible, within the boundaries of medical management advised for you. In case it is your dependents, including aged parents, who need medical care at the AyurVaid Hospital you can depend on us to take complete care of them without your having to take leave of absence from work- i.e. in most cases we take care of our patients without the need for a relation to be present as a bystander through the treatment cycle. Less stress for you overall! As a first step, you can undergo an AyurVaid Comprehensive Health Check-up or directly attend an Integrated Specialty Clinic of your choice. Documentation throughout the diagnosis and treatment cycle tracks the patient’s progress, enables continuous improvement, and brings transparency and accountability to the care process. AyurVaid uses only generic/traditional Ayurveda medicines sourced from quality, reputed suppliers. Important medication used in the treatment procedures is prepared fresh from herbs at the hospital facility. Simple vegetarian diet that is patient-treatment specific is offered to all patients at the hospital. 1. Therapeutic Programs to cure the body of specific ailments. 2. Rejuvenation Programs for general well-being and strengthening the immune system. In both cases these therapies include external and internal medication. In therapeutic programs, Ayurvedic treatments are more effective than other systems of medicines in the treatments of almost all known diseases, especially paralysis, spondylitis, arthritis, rheumatism, bone and joint disorders, slip disc, nervous disorders and their related problems, diabetes, hypertension and cardiac related disorders, sinusitis, migraine and many more. 80 percent of cases have seen marked relief after Ayurvedic treatment is administered; 100 percent results are documented if treatment is begun in the initial stage. It is also very effective for diet and exercise-free weight reduction programs. Rejuvenation therapy in Ayurveda is dealt with Panchakarma, a therapy for overall fitness which tunes the body, organs, mind, breath, nerves and purifies the blood. The Rejuvenation therapies also tone the skin and rejuvenate and strengthen tissues to achieve ideal health and longevity. It increases primary vitality, improves mental clarity and immunity. The rejuvenation programs also consist of (ii) Sweda Karma, or body sudation, which combines massage with herbal oils or herbal powder and medicated steam. These therapies improve blood circulation, tone up the muscles, eliminate impurities from the body, improve the tone and complexion of the skin and reduce fat.